Now we’re going to throw down on something that I’ve had more than a few requests for. I’m going to break out and get some charts, graphs, and price differentials on AWS and Windows Azure. This throw down entry is going to be nothing but money, money, and more money. Have any guesses yet how this one is going to come out? Well read on! This comparison may shock you. The two primary products from AWS and Windows Azure are AWS RDS, or Amazon Web Services Relation Data Store and SQL Azure. The following chart shows the initial cost at 1GB of storage in each, and then the progressive increase in price as we scale up to 50GB. There is one thing to add here, that at 50GB SQL Azure stops, so if you have more than 50GB of storage you want in a relational database, you don’t even have an option in SQL Azure. But let’s just take a look, and then I’ll go through and explain the pricing and declare the victorious. 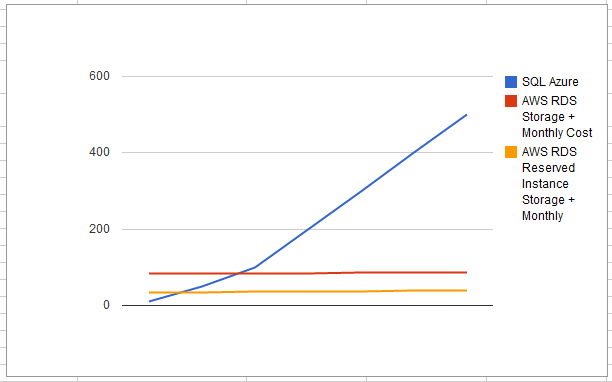 Here’s a graph, with pricing along the left y axis and the storage requirement along the x axis. Feel free to check out the original spreadsheet too. Like I was saying about the surprise. SQL Azure starts out cheaper than Amazon’s options but immediately goes into the stratosphere of pricing! $499.95 just seems absolutely insane. You really gotta love a limited SQL Server to go diving after that RDBMS versus Amazon’s more scalable RDS option, which never breaks $82.50. Really, this isn’t a victory, it’s a wholesale slaughter over SQL Azure. Rating & Winner: Relational Database Storing 1 GB to 50 GB goes to AWS. First off, let’s just take a look at the micro instances. The instances are perfect for testing out, basic development work and developer servers, and even scaling to larger things. Here’s how the costs pan out. The blue, in Windows Azure color shows the Windows Azure Micro Instance. Almost double what a similar instance running Windows Server 2008 would cost you on AWS, and more well more than double, which I’ll point out again in the next section. 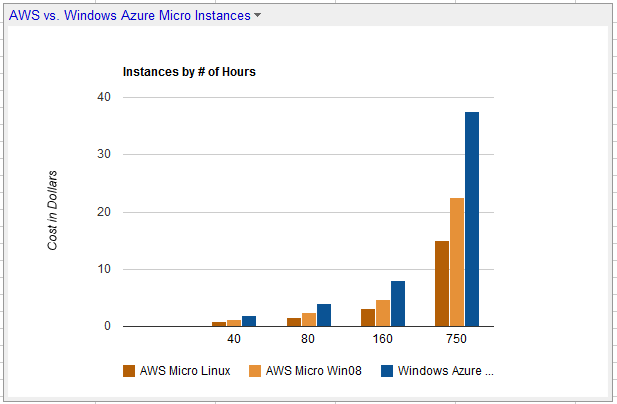 AWS is the obvious cheaper candidate with the smallest instances. But what about the slightly larger sizes, let’s take a look at that. Rating & Winner: Single Instance .NET Web Application running on Windows goes to AWS. Rating & Winner: Single Instance PHP, Java, or Ruby on Rails Web Application running on Linux goes to AWS. Today’s Winners is easily AWS. The rest of my throw down series will be coming over the next week. If you have any ideas or things I should compare the two services on, please let me know. Thanks and hope you enjoyed another bout of the cloud giants. This entry was posted in AWS, Azure, Tech Throw-down and tagged amazon web services, aws, azure, cloud, cloud computing, ec2, virtual, web role, windows azure on November 8, 2010 by Adron. Thanks for this series of ThrowDown comparisons – totally awesome work. 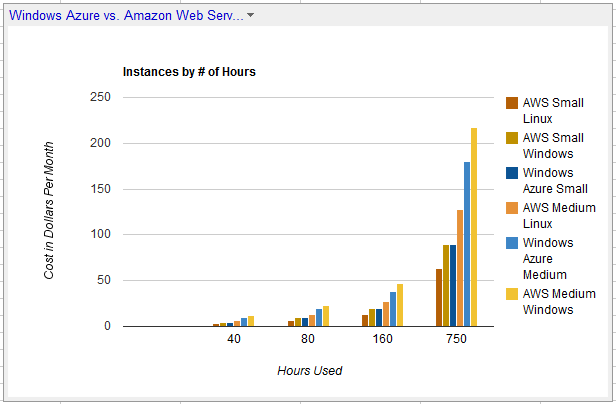 Looking at the spreadsheet it’s good to see that you’ve included Amazon reserved instances. I think it might also be interesting to include the Azure reserved pricing too – http://www.microsoft.com/windowsazure/offers/popup/popup.aspx?lang=en&locale=en-US&offer=MS-AZR-0006P – IMO, it would be crazy to deploy a live Azure service without using at least some element of the reserved pricing. Glad to do it. It was a lot of fun putting the information together and specing things out. Not 100% sure, but I think the “accelerator programmes” have been there since the commercial launch. They certainly seem to represent much better value than the Pay-As-You-Go pricing. Really interesting comparison. As of instance prices, you could also try http://www.cloudorado.com. It calculates price for a server for IaaS providers. For performance comparison, you could go to http://www.cloudharmony.com, with benchmarks for many providers, and http://www.cloudsleuth.net for network performance. Cloudorado and CloudHarmony unfortunately don’t have Azure, probably because they focus on IaaS, while Azure is more PaaS.